Tonight was yet another stair practice at the Aon building in downtown Los Angeles. And as always, I was dreading it all the way there on the train. I got a bit of a late start, due to some computer problems with My Pet Project today, but I finally managed to get out the door. Kathleen was coming downtown, too. I told her I was planning on doing one run up the building for time, and then I’d walk up it again with her. There was some sort of problem on the Metro Red Line tonight. I rode the train to the 7th St station, and that was fine. But when I got off, there was an announcement on the PA. I missed the first part of it, and all I heard was “delays – Metro apologizes for any inconvenience.” They also had the announcement as a text crawl on the monitors in the station, but it seemed that no matter which monitor I looked at, all I ever saw was, “Metro apologizes…” So I figured I was there, so I might as well hit the stairs and get it over with. The last I’d heard from Kathleen was that she was getting on the train at 5:26, so she would be there about 6:00, plus whatever the delay was. I headed up to the building and got ready to go. I’d gotten a pair of the rubber-palm football gloves that Mark recommends, and I was going to try them out tonight. So I started my watch and headed up. The gloves made little rubber-squeaky noises on the railing all the way up. I was just sort of cruising, but when I got to 56, I had a look at my watch and realized that I had a chance to do a good time if I really hit it for the last four floors. So I made some faster rubber squeaky noises and ran up the last four flights. I stumbled out of the stairwell and flopped on the floor. 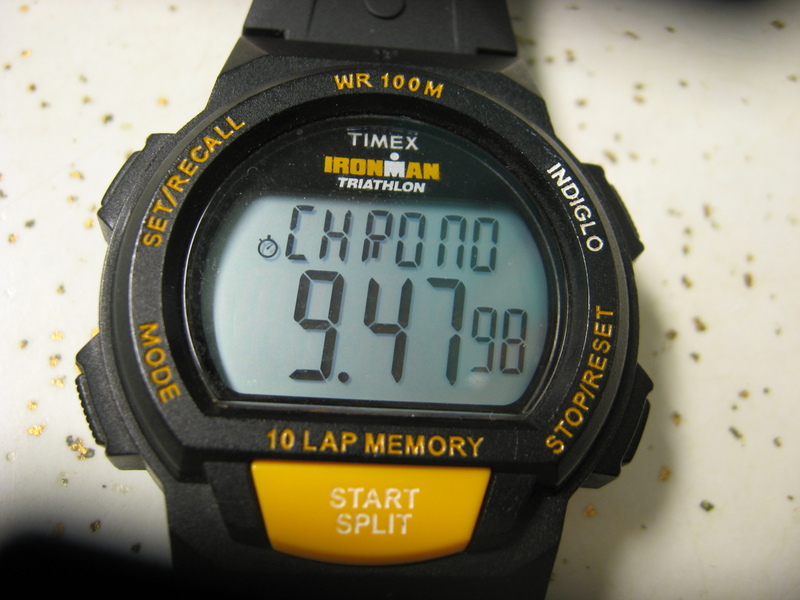 And when I looked at my watch, I saw 9:48, which is yet another best time for me. Can’t complain about that at all. I rested for a few minutes and then went back to the lobby to wait for Kathleen. As it turned out, she was caught in the train delay, and she didn’t get there until 6:40. She asked me if I’d noticed anything different on the 52nd floor, but in my stair-climbing fog, I hadn’t. So we headed up the stairs again. Since I was going slower, I figured I’d see whatever it was this time. When we got to about 40, the guards made the announcement that practice time was almost over. So I went ahead a bit and stopped at the intercom at 49 to call them and see if we could have an extra five minutes to finish. The guys said it was all right, so I continued on up to 52. 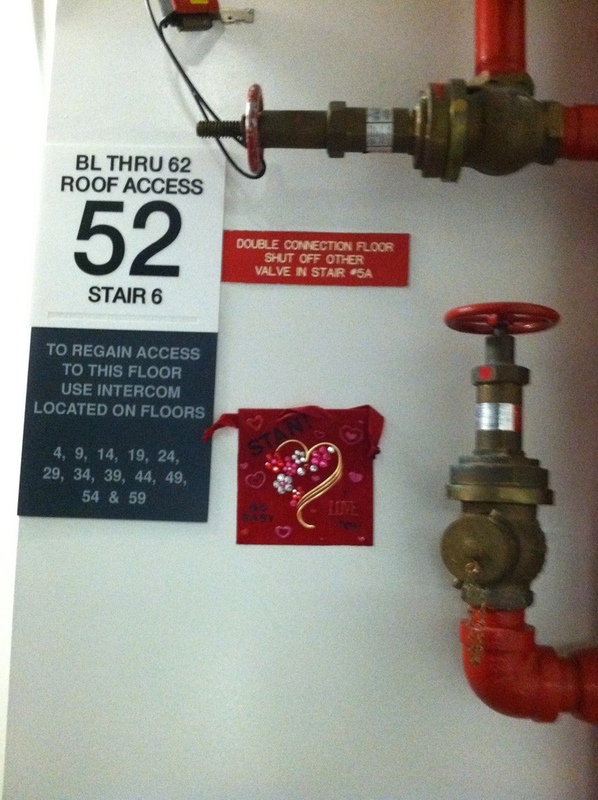 That’s where I saw my Valentine on the wall, next to the fire hose valves and the floor number sign. It was the sweetest thing ever, and even better, because it meant that she’d had to climb the building before to install it. 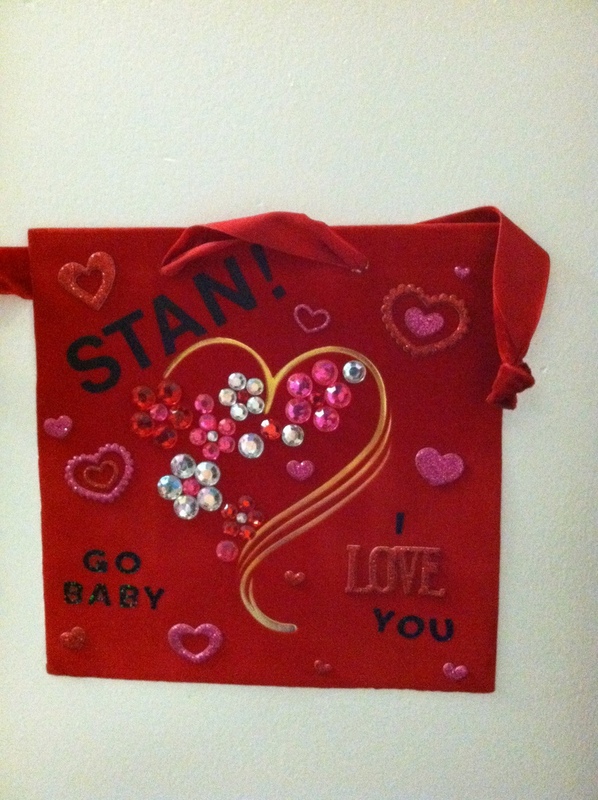 She said later that she’d come to practice late last Thursday to put it up, so that it would be there for me today. So we climbed the rest of the way up to 60. We came out and then rode the elevator back down. And then we got changed and headed out for a nice dinner at Engine Company 28, just around the corner on Figueroa St. All told, it was a very nice Valentine’s Day.